BarnYard Petz - Fantastic 3-Hour Class We even give you the fabric requirements! BarnYard Petz is one of Eazy Peazy’s newest fun and unique patterns. Written for all skill levels this one makes a fantastic in-shop 3-hour class. 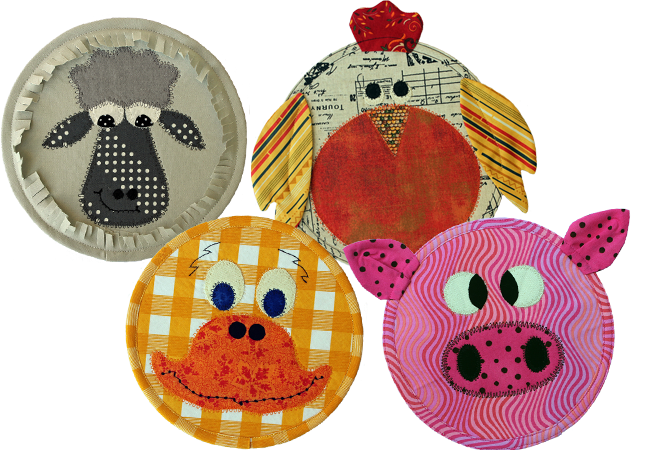 Each of the Petz – BaaBaz, Cluckerz, Quackerz and my personal favorite, Porkeez – are made using a Bosal 8-inch round mug rug form so they are quick, cute and, like all our patterns, EAZY to sew. BarnYard Petz instrucitons are clearly written, a snap to follow and are accompanied by top quality illustrations. Included are templates for each piece of all four faces. As an added bonus for quilt shops - our friends and business partners – here is link to a downloadable and printable pdf with the fabric, materials and supplies needed for each student.